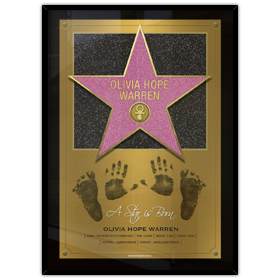 Commemorate more than just your star child's birth - include their tiny foot and/or hand prints on their poster and you will marvel at how little they were, once they are all grown up! Footprint kits are easily and cheaply available through ebay, all you need to is send us a scan or a photograph of the prints and we do the rest! POA for sending and using acrylic glass.